On Feb. 2, Punxsutawney Phil, our nation’s beloved groundhog, emerged from his burrow at approximately 7:30 a.m. EST, predicting an early spring. Although yesterday was uncharacteristically warm for early February, I don’t buy it. Between the record-breaking low temperatures we had in Connecticut last week and the chilly weekend to come, it seems like winter here is far from over. It was so cold last week that I took an Uber to my class on Pearl Street. Yeah, you read that right. But the recent temperatures have also taught me something extremely valuable, and it is that dorm snacks are extremely important. You must be prepared for the times when you don’t want to trek through the snow all the way to Swings, or when it’s Saturday and Usdan closed three hours ago, but you have no money left on your debit card to order in Domino’s. That’s where your dorm snacks come in. However, I’m not talking about the basic stuff, like Kraft Macaroni and Cheese, or Quaker instant oatmeal cups. As creative Wesleyan students, we can do better than that. Like the Spice Girls so famously said, “Spice Up Your Life.” This semester, that should be your dorm room snack philosophy. Here are the top five items you need to elevate your dorm-made cuisine. Personally, whenever I go to Trader Joe’s, I somehow always manage to get lost in a sea of free samples and their extremely extensive selection of cheeses. Last week, however, was different, because I found a small nugget of gold in the spices aisle—a diamond in the rough, if you will—TJ’s infamous “Everything But The Bagel” seasoning. 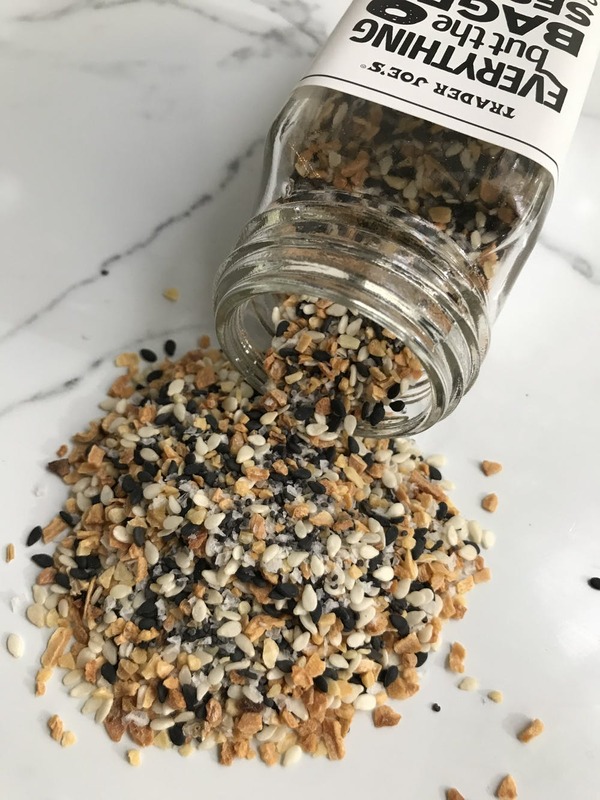 This blend is made up of white and black sesame seeds, poppy seeds, sea salt flakes, dried garlic, and dried onions. Together, they taste exactly like biting into a fresh, everything bagel from your favorite local deli. Sprinkle a little bit of this blend on top of macaroni and cheese, avocado, hummus, or, my personal favorite, a GG cracker with cream cheese. It really doesn’t get any better than that. One of my favorite ways to procrastinate on my homework is to browse through the infinite number of items on Amazon. I recently stumbled upon cupcake-flavored almond butter, so I decided to try it out, given my love for both almond butter and cupcakes. I thought that it was going to be gross, but let me tell you—it is scary how much this almond butter actually tastes like a cupcake. And the even scarier part is that it doesn’t use artificial flavoring! Sounds too good to be true. The almond butter comes in individual serving packets, so I’ve been squeezing it on absolutely everything lately. It tastes amazing on toast, crackers, dark chocolate, and even fruit. It could also double as frosting if you wanted to whip up a tasty mug cake in your microwave. With the invention of flavored almond butter, anything is possible. “GG Crackers” look like a piece of cardboard, but they don’t taste like cardboard. They are traditionally baked crisp-bread crackers from Scandinavia, and they have four grams of fiber in every cracker. The good news is that you don’t actually have to go all the way to Scandinavia for these—they’re easily found on Amazon or at ION Market on Main Street. These crackers are extremely filling and are especially great for breakfast as you’re scrambling to get to your 8:50. Because they don’t have a lot of flavor on their own, they absorb pretty much anything you put on top. They pair wonderfully with items like Laughing Cow spreadable cheese or the spicy hummus from Weshop. You can even make sandwiches with them, using the crackers as a bun, or put some tomato sauce and shredded cheese on top for your own version of a personal pizza. What if I told you that you could have peanut butter that wouldn’t expire until after you graduate? PB2 is powdered peanut butter, and it has a shelf life ranging anywhere from 4-5 years. If you really wanted to, you could take the same jar of peanut butter along to every dorm room you have at Wesleyan. Making PB2 is simple—all you need to do is mix it with a tablespoon of water, and voila! You have peanut butter! If you have a blender, PB2 can elevate any smoothie or bowl of oatmeal. PB2 also comes in a chocolate-flavored version if plain peanut butter isn’t your thing. I know that keeping a bag of chocolate chips in your room can sound either super weird or super boring, but it comes in handy more than you think. Chocolate chips or butterscotch chips are a great add-in to any bag of popcorn and easy to throw into a cup of hot chocolate for a richer flavor. However, my favorite thing to do is to combine chocolate chips with the PB2 to make a peanut butter dip. All you need to do is mix together some cream cheese, PB2, and chocolate chips, and you have a delicious and easy dessert dip that tastes awesome with apples or strawberries. Keeping a bag of chocolate chips in your dorm will prove to be convenient throughout the semester, I promise. And anyway, who doesn’t love chocolate? And there you have it: five simple snacks to keep in your dorm room that will change the way you eat this semester. Next time there’s a snowstorm, you’ll know whom to thank.